Wednesday, July 25, 2018 by Isabelle Z. 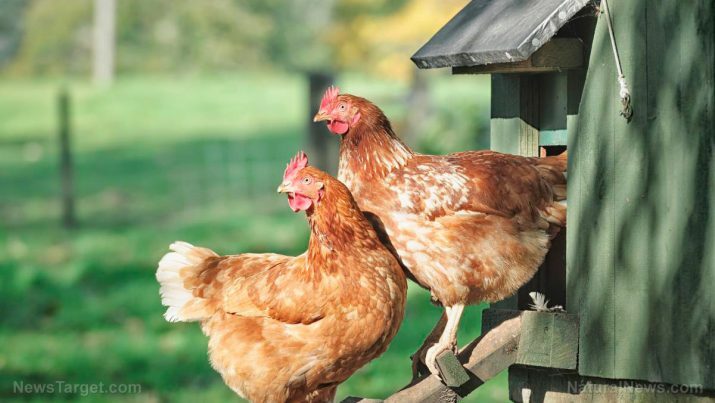 Keeping backyard chickens appears to be more than just a passing fad as more and more people get a taste of the confidence that comes from knowing where their eggs come from and the joy of watching these animals live their lives to the fullest. However, any time people make even the smallest gesture toward self-sufficiency, the government is always ready to step in and rain on their parade. Case in point: The CDC is now spreading false fears about the salmonella risk of backyard chickens. Headlines designed to alarm people were popping up in the mainstream media yesterday. For example, CBS News warned “Backyard chickens sicken people in 44 states.” The article goes on to explain how what it terms an “outbreak” of salmonella from backyard chickens is affecting people from 44 states. In total, they report that 212 people have become ill from their backyard chickens since February. However, the Daily Bell did some calculations that helped put the situation in perspective. The CBS News article estimates that one percent of American households currently keep chickens. This would equate to 1.26 million American households. When you factor in that the average household is made up of 2.58 people, that would mean that around 3.25 million Americans are exposed to such chickens. Therefore, .006% – less than a tenth of one percent – of those who live in a household with backyard chickens got sick from the animals so far this year. Let’s compare that figure to the percentage of people who contracted salmonella from store-bought eggs and meat. With 1 million cases of salmonella being recorded in the U.S. every year, an individual’s chances of catching the illness from store-bought meat or eggs is one in 320. Your chances of getting it from backyard chickens are one in 15,330. When the Daily Bell extrapolated the numbers of salmonella from backyard chickens so far this year to account for the fact that the year isn’t over yet in the interest of making a fair comparison, they found that people are still 24 times more likely to contract salmonella from NOT keeping backyard chickens. So why is the CDC warning people about backyard chickens and not saying a word about factory-farmed eggs? After all, your chances of getting it from the latter are clearly higher. It’s pretty obvious what’s going on here. The CDC’s beef is with people becoming self-sufficient. When you see how easy it is to keep backyard chickens and how many benefits it provides, your next step might be to grow your own produce. Before you know it, you won’t need the food industry or the agencies the govern it in your life at all and they can’t let that happen. And apparently they’ve got the media on hand to help protect the status quo. The labels on commercially sold eggs are a joke. For example, many people believe that free- range chickens get to frolic outdoors and run around all day, but the truth is that they might have access to a small slab of concrete outside in theory; they’re often so packed into their quarters that reaching the outdoor space is impossible in reality. Their beaks are often cut, and many of the chickens living on factory farms live miserable lives. It’s not surprising that those who know what goes on in the commercial egg industry don’t want to support it in any way. If you’re already keeping your own chickens, don’t let these headlines scare you. And if you’ve been thinking of doing so, don’t let them discourage you. As long as you wash your hands after touching them or anything they’ve been in contact with, your chances of contracting salmonella are quite low. It’s a rewarding endeavor that gives you a reliable supply of a safe and nutritious food, it’s a great experience for children, and it can give you tremendous peace of mind.